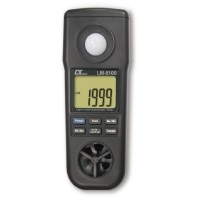 * When LUTRON meter with RS232 interface is connected to RSW-914, the meter can share data via WiFi technology. Therefore, personal devices, like desktop, laptop, smart phone, tablet… with WiFi function can be read the measuring data via WiFi. 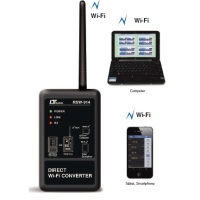 For example if factory installs Power analyzer DW-6095 with RSW-914, then operator can monitor the power information ( measuring value ) via WiFi network with safety. * Allow 1 meter and max. 12 channels ( the total ch. no. ) input. 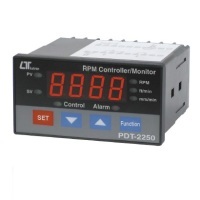 * Easy operation, no setting requirement in the RSW-914 are required, just connecting the RSW-914 to RS232 meter and power ON only. 1. DC 9V power input. 2. DC 9V power output ( power supply for the connecting RS232 meter ). 3. Meter RS232 input ( photo isolate RS232 type ). 1. ACV to DC 9V POWER adapter. 2. RS232 interface cable, UPCB-03 x 1 PC. * APP ( Android ) and APP ( IOS ) are available. * After smart phone or tablet install the APP, following to select the WiFi SSID of RSW-914 then user can monitor the measurement value, log, High/Low alarm or send the warning message out via SMS or Email.